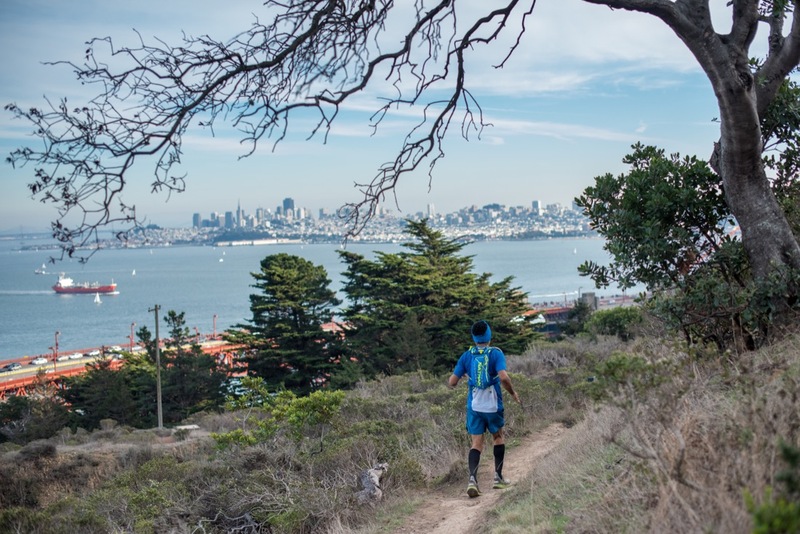 Set in the beautiful Northern California countryside, the BayTrailrunners Coastal Marin 50K rides high above Stinson Beach, across Mount Tamalpais, over the Marin Headlands and finishes with a crossing of the Golden Gate Bridge. This 50k makes the most of this spectacular area with a small, non-competitive group run perfect for the mid-packer or beginner who has never completed an ultra before. And yet the elite set can also enjoy the run as a way to take a break from serious training and hang out with new friends. From a San Francisco assembly point, our group of about 25 runners rides on a brightly colored vintage school bus to Olema, California, a small town just south of Pt. Reyes. The adventure starts at the Bolinas Ridge Trailhead, and continues along trails that stretch all the way back to San Francisco. Once everyone is geared up, the horn sounds and the run begins. All in all, this is a time for community and new friendships, free from judgements made about performance. Back-of-the-pack runners are picked up by the group and encouraged to reach their goal. While this communal support can thrive at our big races as well, it’s also common to see people lose their friendly nature, cop attitudes and become far too intent on time and personal triumphs. Not so in this ultra. The overall run, now held three to four times a year, is broken into four segments with a mobile aid vehicle that meets us along the way before the final stretch across the Golden Gate itself. Throughout, the terrain is varied and awesome. Right from the start, our trail paradise includes open grasslands with grazing cattle, cool morning mists and redwood forests. The climbing is moderate for most of the way and heads up along the Bolinas Ridge, where great views of Tomales Bay and Point Reyes start to appear in the far distant background. Next we run across the Coastal and Matt Davis Trails. These trails may be the most beautiful set of trails many runners have ever seen. The slowly rising Coastal Trail opens up to expose grasslands that offer stunning views of Bolinas and white, crescent-shaped Stinson Beach below. We have a professional photographer on site to capture each runner as they pass through this unique vista. Once reaching Pantoll Ranger station on Panoramic Highway and our second aid stop, runners can regroup, eat, drink and assess how they are doing physically. Leaving Pantoll, we pass through more woods and come out at Cardiac. This renowned intersection of trails is the apex of the oldest trail race in US history, The Dipsea Race, and gives us a chance to reflect on all the great runners who have passed through here. The decent down Dipsea is easily the most technical section of the course. Because of exposed rocks and roots, runners are advised to take it easy for a bit. Soon, we cross Muir Woods Road and hit Miwok. What starts out as a gentle glide across some pleasing single-track soon turns into the first major climb of the day. Runners grind up the trail towards the third aid wagon stop at the Highway 1 crossing. Spent, and a bit sore from the climb, runners welcome the break, where high fives and sweaty hugs are exchanged. After some very necessary refueling, we charge on. Just over the next hill, heading towards San Francisco along large, sweeping switchbacks, is Tennessee Valley, where the marathon distance will be met, and where many runners report a great sense of accomplishment. Tennessee Valley is also our fourth and final aid stop, but a very important one, because just ahead is the challenging Marincello climb. The long, grinding uphill stretch of this never-ending fire road can do evil things to even the most seasoned veterans in our sport. Fortunately, it’s a casual roller down from the top, and runners will see the San Francisco cityscape and the north tower of the Golden Gate Bridge peeking over the Marin Headlands. We are nearing home, folks! The final miles over the Golden Gate Bridge gives runners a tremendous rush of energy and excitement to have finally reached this historic San Francisco monument. Back at our cars, and at the end of this exceptional adventure, we normally hang out, drink beers, gorge on food and wait for everyone to finish. Some have family and friends there to greet them, while others drift off and head home. There is a great sense of comradery and accomplishment that hangs around… along with that incredible high that comes after running a 50k.